Two new polls show that Arizona will have a Democratic US Senator — but that depends if Democrats actually become politically active and work for a candidate. And we know from the 2016 election how accurate polls can be. ✪ “In a GOP state that President Trump carried by not quite four points, the Democrats are positioned to pick up a Senate seat in their efforts to gain the majority of the upper chamber,” says Dr. Lee M. Miringoff, Director of the Marist College Institute for Public Opinion. 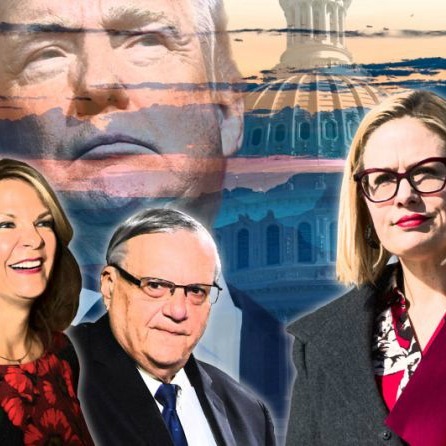 ✪ Echoing this projection, a new Emerson College ePoll finds Rep. Kyrsten Sinema in the lead for the Democratic nomination and also ahead of her three Republican rivals in hypothetical head to head match ups. In the head-to-head matchup, Sinema leads all her Republican challengers. McSally appears to be the strongest competition (trailing Sinema 40% to 32%), while Arpaio (trailing 54% to 30%), and would most likely have the most difficult time defending the seat for the Republican Party if he was to receive the nomination. As an elected Democratic precinct committeeman since 2006 (first in Illinois, now in Arizona) I see the enthusiasm at local Democratic meetings, reflecting the fury that is felt against President Trump. But all the fervor will mean nothing if you — reading this article — don’t get behind a local candidate and work actively to get him or her elected. If you’ve never worked in a campaign, now is the time to start. It’s a lot of fun and really invigorating. Chesney Richter, the Arizona Democratic regional coordinator for Pima County, at crichter@azdem.org and (719) 406-0553. Misha Linnehan, a state Democratic field organizer at 207) 671-0115 and MLinnehan@AZDems.org. They will find a way for you to get involved and help elect Democratic candidates in southern Arizona. ❏ Go to a political meeting and choose a candidate to support. See the list of local candidates at LD9Dems.com. We have more terrific candidates than ever. ❏ Find a list of local Democratic meetings at LD9Dems.com, get off the couch and go to a meeting. ❏ Canvass and walk your own neighborhood with fellow Democrats and speak to constituents. ❏ Join a group in making phone calls. ❏ Attend a party to write Letters and/or postcards. ❏ Host or co-host a neighborhood gathering or house party. ❏ Register voters at a public location. I’ve done all of the activities many times and enjoy all of them. I’ve made friends all across Tucson. The beauty is that you don’t need to do any of these things alone. You will be active side-by-side with fellow Democrats and like-minded people. I was just at a house party in my own precinct. It was an informal get-together over dessert, and we talked about how election districts are set up, our views on the issues, our impressions of candidates — and ate dessert! What a pleasure it was to be in a room with fellow progressives. We were hoping to get 20 people but it was elbow-to-elbow with 35 attendees. These are the exact techniques that the Republicans used to take over our government. They got together in groups and called on voters as a group, and won overwhelmingly. Electing Democrats really is up to you personally. You can keep on yelling at the TV or tune out the news. You can hope for the best and cross your fingers. And that’s exactly what the Republicans and President Trump want you to do. Larry I think you and I are in the same LD so I’ll introduce myself in the next meeting. It’d certainly be easier for people to get involved for Sinema if she were making any attempt to campaign down here. As far as I can tell she’s only made 3 stops in Pima county and has basically zero staff. What’s she doing with the 5 million she’s sitting on? I hope that enough people get involved in state level campaigns, for legislator and governor, that somehow they’ll help put Sinema over the top despite her own poor strategy. Sinema will be in Tucson on Thursday July 5th at Pima Dem HQ from 4:30 to 6pm. Come work at a phone bank and meet Krysten this week! 4639 E First St one block SW of Speedway and Swan. I agree with you, Mr. Bodine. The Democrats are going to need a well staffed, effective ground game to take Flake’s seat in the Senate. I fully believe it can be done. I would certainly like to see Ms. Sinema step it up a notch or two in social media. I think there’s been some improvement lately, and I hope this continues. Below is Alexandria Ocasio-Cortez “critically acclaimed” campaign video. It is mesmerizing. You can’t look away. In addition to excellent content, both text and visuals, what comes across so well is her honesty, humility, and passion.